The Harbor String Quartet was formed in 1997 by members of the Virginia Symphony as part of an expansion of the individual's musical interests. Members of the group have played for such artists as Josh Groban, Mannheim Steamroller, the Trans-Siberian Orchestra, Idina Menzel and the Turtle Island String Quartet. Comfortable with performing Bach, Handel and Mozart as they are with the music of The Beatles, Bruno Mars to John Williams' Star Wars Saga, the quartet has been honored to represent the Virginia Symphony and Virginia Arts Festival on numerous occasions, performing at benefits and other events. You can learn more about The Harbor String Quartet by visiting the About and Bios pages. 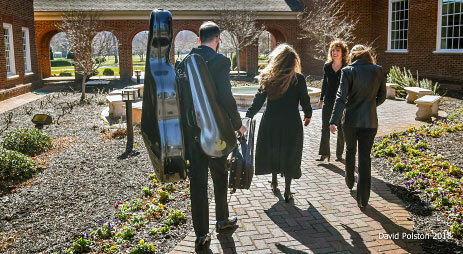 Visit our Booking Info page for how to book a duo, trio or quartet ensemble.